Things constantly change but many families still eat fish on Fridays. Do you need an easy fish recipe for tonight? Here’s our Easy Friday Fish recipe that is super easy and appeals to both adults and kids. Want more? It has only 5 ingredients (one is water! ), is cooked in one skillet, and will truly not take more than 15 minutes to make. This recipe was also featured in Positive Mom’s Magazine in an article as an easy fish recipe for kids and toddlers. Yes toddlers! It’s easy for even the little ones with a spoon and is great way to introduce fish. Here’s the recipe just in time for tonight! Place fish in a large skillet. Sprinkle w/ salt & pepper. Add water & lemon juice to pan. Bring to a low boil, then reduce heat to low. Cover & simmer for 5 minutes. Sprinkle couscous (and flavor packet) around fish. Top w/ tomatoes, including juices. Cover & cook 5 more minutes until fish flakes easily. Flake couscous w/ fork & serve from skillet. Serve with some crusty bread and some mixed greens (we love baby kale, shredded carrots, and chopped mushroom salads!) 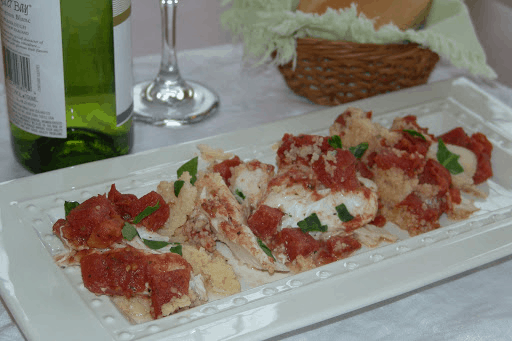 Give our Easy Friday Fish recipe a try and tell us what you think! As with many Dinner Daily recipes, this one is easy to make and won’t keep you in the kitchen all evening either cooking or doing the dishes! Most of our recipes have 30 minutes or less time-to-table and use easy to find ingredients. Did we mention we provide weekly dinner menus with recipes like this based on what’s on sale at your grocery store? Learn more here or give the Dinner Daily a try – the first two weeks are free! Love love love! It saves me time and money! We aren't eating the same dishes over and over again. I love that I can set my favorite store and change the menu as needed.